At 06:15 of November 30, 1971, the Iranian marine commandos, the takavaran, stormed the beachhead at the Great Tonb and put an end to sixty-eight years of Anglo-Qassimi usurpation of this island at the entrance to the Persian Gulf. As the gunship IIS Bayandor watched over the operation, the IIS Artemis was busy landing troops on Abu Musa. All the while, the Iranian jets flew overhead. On Tonb, the landing party used a blow horn to say that they had come not to wage war, but to reclaim their land. "We will respect your rights, protect you, and assume responsibility for your progress and development," the announcement said. The Iranian commandos were under order not to shoot, unless they were fired upon first. When the four Ras al-Khaimah policemen surrendered, three of the Iranian officers headed to the police station in order to secure the station, but the police chief, a Yemeni national, decided to open fire. Three Iranian officers lay dying. The Iranians returned fire and killed the police chief. In reporting the fateful events of that day, Reuters news agency put the number of Tonb's inhabitants at 70 souls. The sheikh of Ras al-Khaimah claimed that some 350 people alone were ferried by the Iranians to the Arabian coast, implying that the island had a far greater population that the 70 reported out of Tehran. No matter what the human head count of this island, no one could come even close to claiming a greater presence on it than the colony of small venomous snakes that had populated it and its surrounding waters for centuries. The geographical reference to Great Tonb as an abode of snakes is a long-standing practice. In J.R. McCulloch's geographical dictionary (London, 1866), the island was identified as Slangen, which is derived from the Dutch word "slang," meaning "snake." In Sir Arnold Wilson's 1927 speech entitled "A Periplus of the Persian Gulf" the island was described as devoid of inhabitants other than only snakes, seafowl and, in the spring time by the ubiquitous swallows. The reference to the island's reptilian denizens was recorded in official Iranian reports. In the summer of 1928, the Iranian customs service detained a Dubaian dhow on the suspicion of smuggling. In the treasury department's record of the pilot's interrogation in Persian, dated 28 Shahrivar 1307 (September 19, 1928), the island is referred to by the Persian interrogator and the pilot variably as Tomb-i-Mar, meaning the tonb of snakes, and Tombar, a variation of the first. In more recent times, Ghulamhossein Mosahib's Dara'ati-l-mua'arif-i farsi (Tehran, 1965) referred to the isalnd as Tal-i-Mar, meaning a hill or heap of snakes. Similarly, in Muhammadali Djenab's Khalij-i Fars (Tehran, 1970) reference is made to Tonb-i-Mar. And, where there was no direct reference to snakes, their presence on and around the Great Tonb was noted in the isalnd's description. One such example is the eleventh edition of the Persian Gulf Pilot (London, 1967). In the foregoing, while the word "tal" and its variants like "til," "tel," and "tol," occur both in Persian and Arabic, the word "mar," meaning snake, on the other hand, is exclusively a Persian word and it is of pre-Islamic origin. Its use as such in connection with the Great Tonb is also an exclusive Persian usage. There is no originally Arab practice of referring to the island in reference to snakes or the use of the word "mar" or "tal." Following the landing of the Iranian troops on the Great Tonb, a number of perennial Iran-hating Arab governments protested to the United Nations, asking that its security council examine the situation. Chief among the complainants was the government of Houari Boumedienne of Algeria. In July 1972, as the Iranian and Algerian governments moved to normalize their long-frozen relations, the Iranian deputy foreign minister was sent to take part in the festivities commemorating Algeria's independence. Boumedienne asked why the envoy's government had seized these three "Arab" rocks. The envoy responded that the only living thing on these rocks were snakes and snakes have no nationality. How little the Iranian envoy to Algeria know about the demography of Great Tonb and Abu Musa, where the Iranian troops also had landed! Even less did he, or anyone else for that matter, know about the national origin of the snakes and lizards that populated the Great Tonb at the time! But not to professor S.C. Anderson of the Department of Amphibians and Reptiles at the California Academy of Science in San Francisco, California. In 1958, he spent nine months in Iran studying the country's herpetofauna and collecting specimen. His work was immortalized in Zoogeographic Analysis of the Lizard Fauna, comprising chapter ten in volume one of the Cambridge History of Iran (W.B. Fisher, editor, 1968). Anderson discussed the distribution of the Saharo-Sindian species of lizards along Iran's southern littoral in reference to three distinct coastal sectors: Khuzestan and the Persian Gulf, Makran and Baluchestan, and the Islands. In reference to Jazireh-ye Tanb-i-Buzurg (Great Tonb), he noted the occurrence of the lizards Bunopus tuberculatus and Eremias brevirostris. The first specie, Bunopus, was found also to occurred on the Makran and Baluchestan coast, from Bandar Abbas along the Sea of Oman to Jask; this specie did not occur on Khuzestan and Persian Gulf coasts, from Bandar-i-Bushire to Bandar-i-Lingeh. As for the other specie, Eremias, he noted its occurrence also on Qishm Island and on Khuzestan and Persian Gulf coasts, but not on the Makran and Baluchestan coasts. 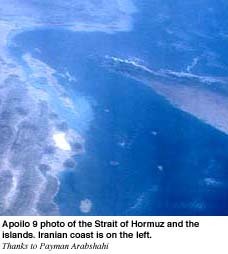 The presence on the Great Tonb of a specie from the west of Lingeh/Bandar Abbas area and one from the east of the Bandar Abbas area and the sharing of Eremias with Qishm Island lead to the conclusion that the Great Tonb was in a distant past connected with Qishm Island and the two were joined to the Iranian mainland, in the hallow of the Abrukamanan curvature that marks the present day coast from Lingeh to the east of Bandar Abbas. Anderson wrote: "Of additional interest is the distribution of Eremias brevirostris, known from West Pakistan and from the western Persian Gulf, but never recorded from the Makran coast. It is known from Qishm island and Jazireh-ye Tanb-i-Buzurg, islands off the Makran coast. This suggests that these islands may have been connected with the mainland at a time when distribution of Saharo-Sindian forms was continuous along this coast." The reference to snakes in the Persian nomenclature of the Great Tonb is exclusively a Persian phenomenon. According to Pirouz Mojtahed-Zadeh, an Iranian student of the Persian Gulf, the very word "tonb" itself in the Tangestani dialect of southern Iran means 'hill.' Anderson's faunal observation then adds one more indication of the biological connection between the Great Tonb and the Iranian mainland. In discussing the Island lizards, Anderson noted that "The few lizards known from these islands are listed here, with the island from which they were taken in parentheses." It is not known if Anderson himself actually went to the Great Tonb to collect samples. If not, then who did? If Anderson did go to the Great Tonb, then the next level of legally significant inquiry would be: when did he or another go there and by what means and with whose permission? A compromise over the disputed Persian Gulf islands?